All of a sudden, those rolled pieces of brisket and the big slabs of pork belly in the butcher’s window don’t seem like such a bad idea. Nor do the ox tails, hanging in braces on butcher’s hooks like some sort of skewered alien lifeforms. The tail of a cow does a lot of work. It’s never still, a simple swatter whose main purpose is to swish backwards and forwards to keep its owner fly free and comfortable. It’s a cut of beef that’s worked hard, and it’s therefore tough. It’s very tough indeed, and it needs careful cooking to tenderise it – long, low, slow. It must be braised in some form of liquid, the marrow from those plentiful bones melting into a rich and thick sauce. If that liquid is red wine, then so much the better. Add the Holy Trinity of vegetables – carrot, onion, celery – and you can see, smell, sense how this is going to shape up. First thing’s first. You need an oxtail. Buy a whole one, and have the butcher chop it up for you. Seriously, this is why butchers have those massive cleavers. You aren’t going to get very far doing the chopping on your own, no matter how good your knives are … chopping up an ox tail is a brutal, inelegant job best left to the person with the biggest tool. Don’t let the butcher fob you off with a load of skinny pieces from the end, either. Buy a whole tail and ask for the thick bits to be cut into two pieces. This is where the best meat and the best marrow is. It’s possible to make a thoroughly decent stew or casserole with oxtail, but such a thing, good as it undoubtedly is, will in my book always feel like a bit of a let down, as if there’s a part missing. It’s destiny is to become a pie. And a pie it shall be, paired with the King of all pastries, at least when beef is at hand – suet crust. That’s for later. There’s braising to be done, and that takes at least twenty-four hours. These quantities make enough for two decent sized pies. The filling freezes very well, so it makes sense to double up and feel like a mid-week food hero at some point in the future. For these amounts, I used two good-sized oxtails, about three kilogrammes in weight. The first thing to do is to start as you mean to go on, and marinade the suitably chopped up oxtail in a whole bottle of red wine, overnight, in the fridge. This is an important step – beef wallowing in red wine for an extended period is the closest thing to alchemy that I know of. It’s a transformative process that adds more to the finished product than the sum of its parts suggests. When you’re ready to cook, which should be at least five or six hours in advance of when you want to eat, drain the oxtail pieces and reserve the red wine. Pat the joints dry, dust them with seasoned flour and fry them over a medium heat until browned and caramelised. All the usual advice about this sort of process stands – don’t overcrowd the pan, don’t nudge the meat around too much. Just let it sit and sizzle until it’s nicely browned, then flip it over to do the other side. Collect the browned oxtail pieces in a large metal casserole dish, something that’s at home on both the hob and in the oven, and add three large chopped carrots, a couple of sliced onions, a trio of sticks of celery, sliced, and six cloves of garlic, crushed. Add three bay leaves and a generous seasoning of salt and pepper, and pour the reserved red wine over the meat and vegetables. If you happen to have some good, homemade beef stock lying around, top the pan up with that – about 500ml should do it, but a little more won’t hurt. On no account use a stock cube. That would be barbaric, whatever Marco says on those adverts. If you don’t have stock, use water. I mean, honestly, there’s a whole bottle of red wine in there, and the best part of a kilo and a half of beef and beef bone. This is not the sort of dish that’s going to lack backbone because you used water instead of stock. Cover the casserole dish with a lid, and put it into a low oven, about 140c, and leave it there for at least four and a half hours. Don’t open the oven to have a look, at least not too often, and definitely not in the first three hours. Don’t prod. Don’t poke. Just let the gentle heat of the oven get to work on that bone marrow, on that beef, melting all those flavours together into one glorious symphony. This is slow cooking at it’s finest. When the meat is cooked it will fall away from the curiously shaped bones. Fish all of the pieces of oxtail out of the sauce onto a plate, and let them cool for a while until it’s possible to handle them. Strip the meat away and set to one side, and discard the bones. In the meantime, lift the pan onto the hob and crank up the heat under the sauce and let it reduce by about two-thirds until it’s rich and concentrated. Adjust the seasoning, and return the meat to the pan. That’s the filling done, now for the all important lid. At times like this, I usually end up turning to Delia Smith’s Complete Cookery Course for a recipe, feeling unfashionable and defeated. This book is the place to find out how to make things like suet crust pastry. Please stop judging me. It’s very easy. 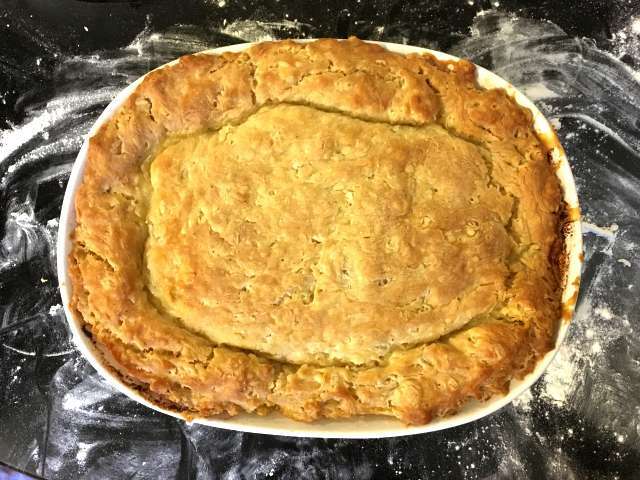 225g of self-raising flour, 110g of suet (using vegetarian suet here would be insane), salt, pepper and enough water to bind everything together into a pliable, slightly wet dough. These quantities will make a crust of reasonable thickness for a normal sized pie. You may think that this is just not good enough, and could choose to increase the amounts in proportion to a more acceptable level. Let the dough sit for five minutes, then roll it out thickly, at least two centimetres at the absolute minimum. This is not a subtle pie. Transfer enough of the filling into a deep pie dish and roll the crust over the top, crimping the edges. I used a ceramic roasting dish for this, and it was excellent, producing a deep, deep pie with plenty of space for a thick lid. Bake the pie in a 200c oven for half an hour, or until the pastry is cooked through and the filling is too hot to eat immediately. Serve with some sort of token vegetable on the side. This recipe is adapted from Olivia Potts’ wonderful post, for it is she who suggested this treatment for oxtail when I nervously asked the oracle of twitter what I should do with a cow’s tail.